This chocolate teacup is from a mold I bought. It's made from white chocolate candy melts. 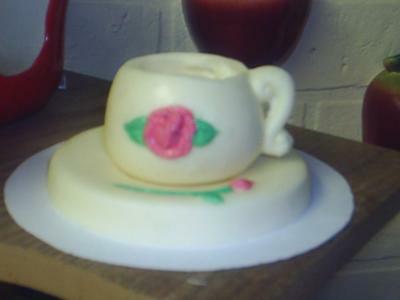 I love your little teacup and saucer made of white chocolate. It is really adorable. I also think it is so cute the way you have decorated it with the little pink rose and green leaves. This teacup and saucer mold would be perfect for making party favors, particularly for a feminine get together like a ladies afternoon tea. Thanks so much for taking the time to show it to us. I hope you'll be sure to show any other beautiful chocolate treats that you make. We always love new candy making ideas! When I order chocolate to be delivered in Ohio it usually just comes in a package that has a bit of bubble wrap around the chocolate or something else to keep it from shaking about too much. The only exception is when it is a really hot time of the year and I've paid extra for cold packs to be included in the package. It's up to you, I guess, on what you want to offer your customers regarding shipping.